Designed ostensibly to capture the glamour of Honda’s six-cylinder racing bikes, it seems strange that the CBX to evolved into the angular, faired monoshock machine you see here. 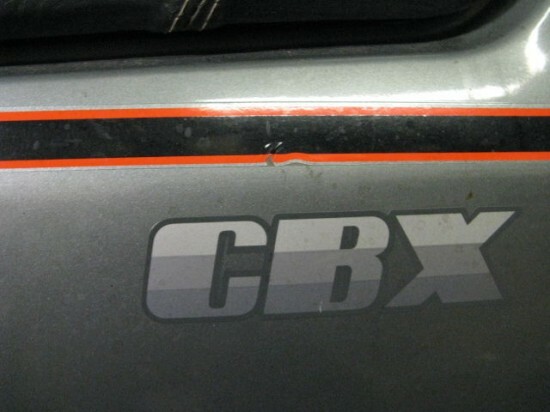 But the bike never really did have any real links to the GP machines, aside from the engine layout, and the CBX certainly couldn’t hang with the true scratchers of the day on back roads. Introduced in 1979 and, in spite of appearances, it was supposedly only a bit wider than Honda’s 750 four. The 1047cc, 24 valve, straight six was powerful and made a fantastic sound, but the sophisticated design was offset by its nearly 600 pounds and typically primitive suspension. 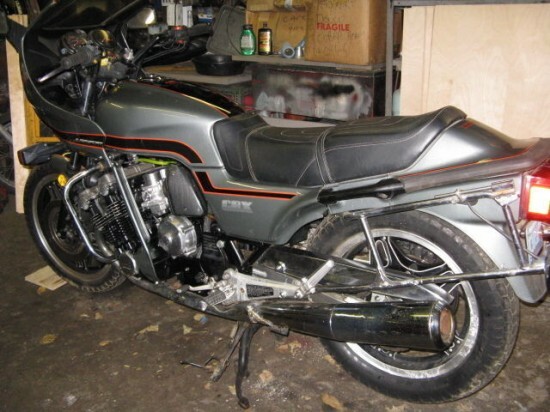 Recast in 1981 with a full fairing and monoshock rear suspension, and hard bags, the CBX became a sophisticated sport-tourer, a role that perhaps suited the platform better. 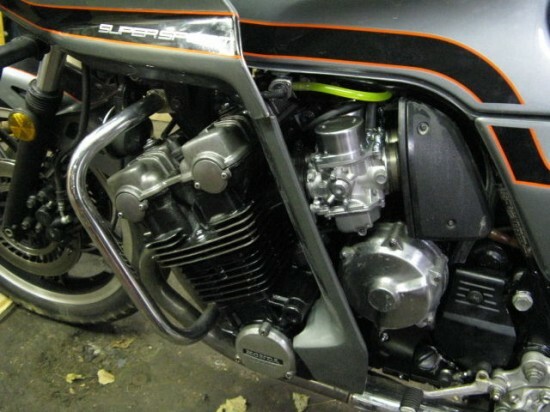 Luckily, the imposing engine and its headers remained on display, leaving no doubt as to what powered this bike. 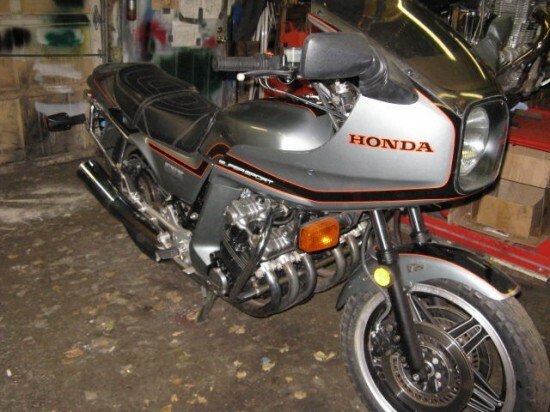 This is a nice original 1981 honda cbx, there are some minor paint chips here and there, normal wear . The gas tank has a small bubble at the bottom right side of tank, the right side cover decal has a small scratch in it . The tires have been on the bike since 1992. the exhaust is in rough condition and has been repaired where the pipes meet the mufflers, this was due to water build up in the lowest part of the exhaust after sitting for a few years. The side bags are missing. This bike was last on the road in the state of New Jersey in 1992. It was repossessed about two and a half years ago for reasons I don’t know and a friend bought it from the holding company and traded it to me. The carburetors were professionally done out in California at a cost of $1,000. I had to rebuild the starter because one of the brushes was stuck in its carrier. I turned the armature, replaced the brushes and the brush springs. I installed the carburetors and the new air box plenum. Put fresh gas in it and fired it up, runs good, goes through all gears smoothly, all brakes work. Chain should be replaced as well as the tires, brake fluid and fork oil should be changed. This bike has been sitting for some time, it only has 5,787 miles on it. These aren’t especially cheap to buy or run but, when properly cared for, they can provide typically Honda durability. I prefer the earlier, simpler CBX’s without the fairing and hard bags, although there’s something about these big, Goldwing-esque machines that appeals as well. In spite of the low mileage, this one isn’t really in collectable shape, but that might just make it a great candidate for customization or upgrading. Or it might mean you can get that wonderful engine on the cheap, and do some traveling to spread the Gospel of the Straight Six to far-flung corners of the continent. 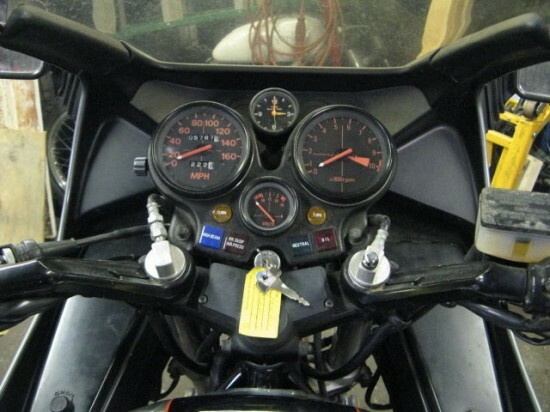 Previous story Low-Mileage, Unrestored1975 BMW R90S for Sale!